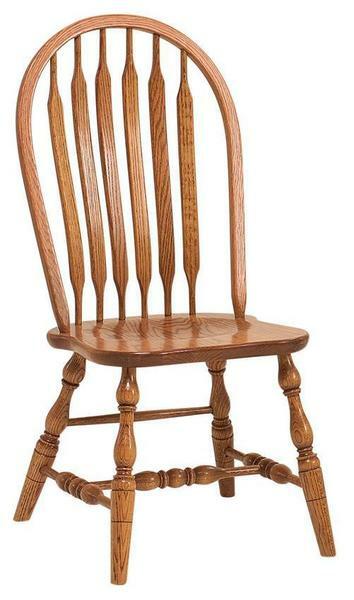 The Amish Bent Paddle Windsor Dining Chair brings the very best in colonial style furniture to your kitchen or dining room. Graceful and refined, this solid wood dining chair emphasizes a natural beauty within its solid wood design. The beloved Windsor chair offers support with its carefully crafted chair back that embraces you as you sit for dinners, visits and good times with friends and family in the richly scooped seat. The bent paddle spindles of the chair back display the quality of Amish woodworking. Every dining chair from DutchCrafters is built with skill and integrity and our colonial American furniture offers true historical reproductions of the chairs used in the New World. The Bent Paddle Windsor Chair is shown here in oak wood with Malaguania stain. Oak wood is strong, beautiful and durable, making it an excellent choice for Amish made furniture. The natural elements and turned legs of this Amish dining chair make it perfect to complement a country style furniture collection. Customize these dining chairs in the wood and stain of your choice. Add arm and side chairs to complete your collection and choose the leg style you like best to truly make these chairs your own. Browse more of our colonial style furniture here. Please call us today with any questions about our Amish furniture. Toll-free at 866-272-6773 or stop by our brick and mortar furniture store in Sarasota, Florida. Shown in Oak with FC-N3176 Malaguania Stain. The I/we, are William and Sarah. We love our chairs, and we are quite happy about the service we received.Thanks again! We look forward to hearing from you. Natalie - Thanks for the beautiful table and chair set. Well done.